So, You Want To SXSW? Forget Christmas; SXSW (South By Southwest or “South By”) is the most wonderful time of the year. For two weeks in March, anyone who is or is trying to be cool descends upon Austin, Texas, for the film, music, interactive, and/or education showcases. The “Veronica Mars” film will premiere there. Little-known bands will play at SXSW and be on the radio in a few months. And most importantly: So. Much. Free. Stuff. Even though I’m an Austin native, last year was my first time at SXSW, and thanks to my more experienced friends I paid $7 for all of my meals and drinks for the two weeks of SXSW. It’s the perfect time to hit up that friend you have who just moved to Austin (one of about 110 per day) for some couch space. As a native, I’m also required to give a spiel about how no one should move here. As much fun as you’ll have during SXSW, it is definitely not the regular state of affairs (though I do think Austin is an awesome place to live, just don’t have that as your expectation). So you’ve found your couch and booked your ticket in Austin at some point between March 7th and March 16th. Now what? 1) Badges and wristbands are for pansies (and lucky people). If you do SXSW right, there is no reason for you to spend between $500–$1700 a badge or $80–$200 on a wristband. If you are industry and/or your company is paying for it, then yes, you will need it for all-access, but if you are just looking for shows and parties, you will be fine without—though you may hate the badgeholders a little bit as they stream into shows while you wait in endless lines. 2) Create an email address specifically for SXSW RSVPs. If you don’t have a spam email account, you should create one just for SXSW. I have 58 RSVPs in my SXSW inbox, and hundreds of emails that these people have sent me since last year. I’m sure this is not the advice that people throwing the parties want me to give, but if they didn’t want hordes of people coming, they would not be open to the public with an open bar. Honestly, RSVPs start popping up late January and you should have already started, but it’s not too late for everything. How do you find things to RSVP to? The Internet, of course! Twitter is a good source: @CameronAtSXSW is the most comprehensive, @SouthByFreeNOMS is your source for free food, @SXSWhoa and @rsvpforyourlife are good. Do512 is also a good website. My friends have a group on Facebook where we share all the parties we hear about, and have a running spreadsheet of events (be sure to note which have free food/drinks!). RSVPster (which is a service that will RSVP to everything for you) also has a free public calendar, as does Sched, which you can filter by parties that offer free food/drinks. Some of the bigger (free) events are: Fader Fort, Hype Hotel, Rachel Ray’s (I know, what?) Feedback Day Party, Brooklyn Vegan events, Vice events, Filter events. SXSW Interactive actually has more/better (as in, more free stuff) parties, but the sponsors aren’t necessarily consistent. Once you are downtown you can walk to everything, but parking can be annoying. Public transportation and bikes are good choices; I used car2go last year and it was fantastic—you don’t have to pay parking meters! And they have free stuff at drop zones! Check the forecast because Texas weather is crazy, especially in March. Case in point: Sunday morning it was 73 degrees, that night it dropped to 26. My SXSW veteran friend recommends bringing a sweater to wear over a fanny pack, then stashing alcohol in the fanny pack (though as I’ve mentioned, you should be covered on the free alcohol front). Whatever you wear, make sure it’s comfortable! I am a die-hard stilettos fan but I would never wear a heel higher than my cowboy boots to SXSW. You will be standing and walking a lot—be sure you are drinking water in addition to your other beverages of choice. The Internet on your phone is probably not going to work (I am guessing the “homeless people as wi-fi hotspots” idea is never coming back). There are charging stations at many shows (like Fader Fort), but I would just accept the inevitable, have a written schedule, and move on. Should you tire of all the abundant free food, there is a well-curated SXSW food court in the heart of everything. The flagship Whole Foods Market is also in downtown Austin (since WFM started here) and it is a magical wonderland. You may hear about the legendary Franklin Barbecue—everything you hear is true, but I’m not sure it will be worth your time to get in line at 9 a.m. and brave the 3-plus hour line (lots of music to see). Try La BBQ or Lambert’s instead, or feel free to explore Texas Monthly’s Top 50 BBQ Joints. Paul Qui of Top Chef has a bunch of famous (and expensive) restaurants here, but go for the strategically located East Side King trailers to get a sample of his culinary work. You are legally forbidden to leave the city without having breakfast tacos, which erase any damage from the previous night. 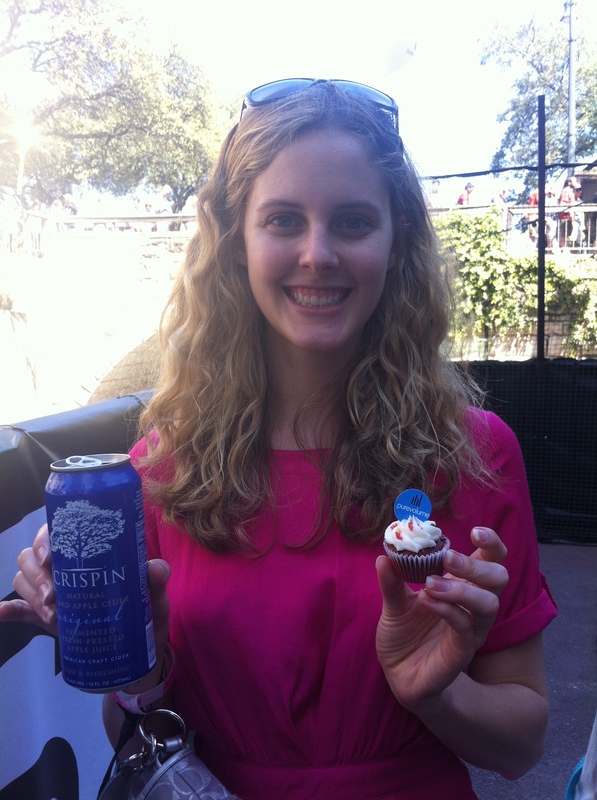 Free cider, free cupcakes. PureVolume is the best! This is by no means meant to be an exhaustive guide to Austin or SXSW, but it will definitely get the ball rolling. Don’t stress yourself out by trying to do everything, just be flexible and have fun! And in case you can’t make it this year, check out some of the many playlists to discover new music! What did I miss? Let me know in the comments or on Twitter! Was Thomas Jefferson A Nonfunctioning Super Genius Or Hipster?